Commercial window tinting is fast becoming less of an aesthetic luxury and more of an investment, especially for the productivity of employees. The benefits of window tint for your commercial building far outweigh the costs associated with installation. Part of these benefits include glare reduction, low energy costs, and added privacy. Privacy within the office is also something to be considered. Collaborative workplaces have are known to improve productivity. Transparency is a big part of making an environment actually feel collaborative – but sometimes information needs to remain private and not be privy to all the eyes passing by. Large-scale monitors are great for inclusion when working on team projects, but what about when the information needs to be displayed to exclude the rest of the workplace? Aesthetically, glass meeting rooms look great, but the contents of the meeting may not be for all eyes. Here is where Casper Cloaking Technology created by Designtex, becomes handy. The invention came about when inventor Matt Mead wanted to find a way to improve videoconferencing calls without removing the glass walls. He wanted to maintain the wide open, window space environment without impacting the workplace feel as well as the quality of the call. Casper Cloaking Technology uses architectural film for glass walls that only prevents onlookers from seeing what is on a digital screen inside the room. People walking past would be able to see the people in the room but no information that is on the LED or LCD screen will be visible. This technology renders the screen dark and indistinguishable to anyone outside of the room. The fundamentals of this invention limits certain types of light emission while allowing natural light to stream through. A person would not even know that the walls have been coated, that is until they attempt to look at the screen that the rest of the room inside the office is looking at. This allows for transparency within the office and confidentiality when required, simultaneously. Information needs to be protected from guests visiting the office such as repairmen, contractors or customers. Visual hacking is another aspect to consider when it comes to the safety of your company data. Hackers are looking for more and more ways to obtain the information that’s needed and can surprise you as to just how sneaky they are. 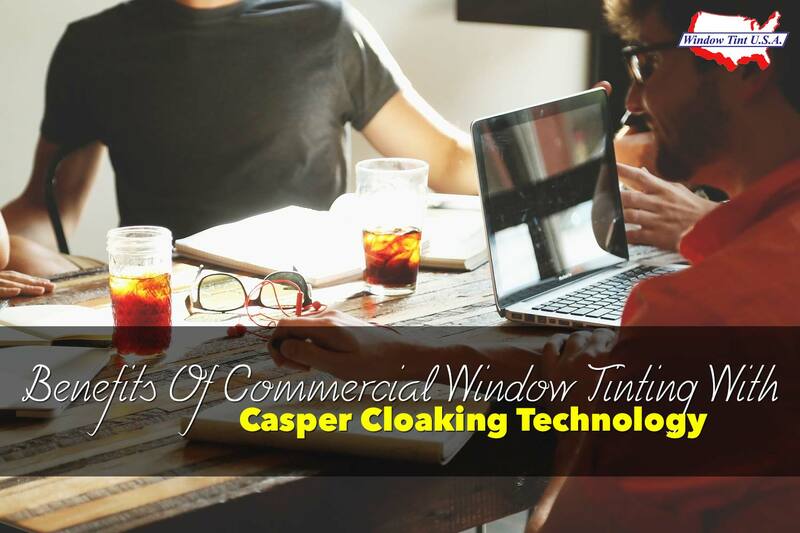 Previous technologies with the same function as Casper Cloaking were not sufficient because although they provided privacy, they did not allow for the clear walls and therefore closed off a space significantly. Using frosted glass meant that the view is blocked both ways, though still allowing light in. In an office space where clear walls and collaborative spaces were not the end goal, this would work fine. Curtains and drapes would also work because they are decorative and aesthetically pleasing, while still providing privacy. However, with all these methods of privacy, they create a sense of distrust and secrecy in an office which is not where office spaces are headed in this day. Screen cloaking not only works for office spaces but can also work for TV’s in bars. Where passers-by stand and watch TV for free as opposed to being a paying customer, window film can solve this issue. You can also feature content freely in your workplace without fear that the wrong person passing by might see it and be offended. Your store front windows can remain see-through; however, your content is protected. One of the advantages of Casper screen cloaking is that your space is left looking almost exactly as it did before installation. If you decide that you require even more privacy but still do not want to ruin your aesthetic, there are more options available to ensure the discretion of your space without obscuring the workplace with large window tints. You can even make use of patterns on the window tint that work in tandem to create optimal privacy but still promote an open, communal feeling space. Your collaborative office space does not need to be ruined by a dark, shaded window tint. Your privacy can be maintained 100% with the Casper Cloaking Technology. If you don’t believe us, reach out and put Window Tint USA to the test. You’ll have privacy and clarity all at once with the comfort of certified window film installers.